It’s important for any business to keep its employees as happy as possible. Happy workers make for more productivity and lower staff turnover, and that’s great for both morale and profits. If you want your business to be successful, you need to make sure you look after your staff first and foremost. So, here are some tips on creating a happy work environment for everyone. Do your employees eat at their desk? Then they need to stop. This is bad for their health, both physically and mentally. No matter how well you think you may have cleaned your desk, it’s going to be grubby and crawling with germs, plus who can really relax and enjoy their food when they’ve got half an eye on emails coming in or they’re typing one handed while holding a sandwich in the other. If you possibly can, offer your employees somewhere specific to sit for their lunch break so that they can get away from their desk and re-set themselves. As well as this, they will take more care about their lunch and actually take the break in the first place – many just work through and although they may think they’re being more productive, they really aren’t. 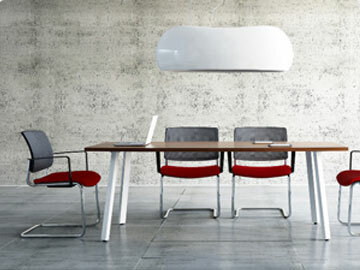 Consider getting into some canteen furniture or breakout furniture for the kitchen or common area. If you want to ensure that your staff feel welcome in their working environment, giving them the opportunity to personalise their own desks, tables or cubicles is always going to help. They will feel more at home and in turn that will make them feel happier and they’ll be more productive. So, what can be placed on the desk, for example? Stress balls, funny mugs, photos of family, friends, and pets, desk toys, presents from the kids, and so much more. As long as whatever it is isn’t going to terribly offend someone (and make the working environment tense and uncomfortable) then it should be allowed. Of course, it shouldn’t get in the way of the work that needs to be done, and either should it be a distraction. You’ll need to work out where to draw the line, but you’ll know if things start to get a little too crowded and you can limit the number of items allowed. Plants are a great way to create a happy work environment even if they may not seem like it when you first think about it. So why are they good items to include in your office décor? It starts with the colour. No matter how hard you try, there will always be something artificial about any kind of colour you choose to decorate your office in. That’s just the nature of interior design. However, for people to be at their happiest and most productive, they need some nature around them; studies have shown that this is the case. Introducing plants into your work environment adds some gorgeous life and a splash of colour, and it improves the mood and productivity of those working there. Plants reduce stress, make it easier to think before acting and they even reduce sickness by purifying the air… Why wouldn’t you include plants in your office area? However, it’s best if they’re low maintenance, like lilies and orchids, otherwise someone will always be tasked with looking after them. There is such a thing as ‘thermal comfort’ and when you reach that, your workers will be at their most productive. It lies somewhere between 21 and 23 degrees Celsius (or between 69 and 73 Fahrenheit). This means that wearing standard clothes and without having to add or remove any layers, someone will feel at their most comfortable. Of course, there will be exceptions as there always are when it comes to human beings, but generally this is the rule. It makes sense then to keep your thermostat at a point where the majority of people are going to be productive and happy. If the office is too hot, productivity dwindles and irritability increases. Too cold and your staff will be distracted and restless or it may induce sickness such as the common cold. As mentioned above, nature is important for humans to function properly, even if they don’t know it. Plants help with this, but another good thing to ensure for maximum work environment happiness is natural light. Hence, it goes without saying that there should be windows in the office. Not only does this increase your staff’s productivity, but it also improves their overall well-being; when there is more natural light in an office, people sleep better at night and do more physical activities, keeping them healthier.